Home > Special Offers > Sales > The Volkswagen Monthly Event! It's the Volkswagen monthly event! 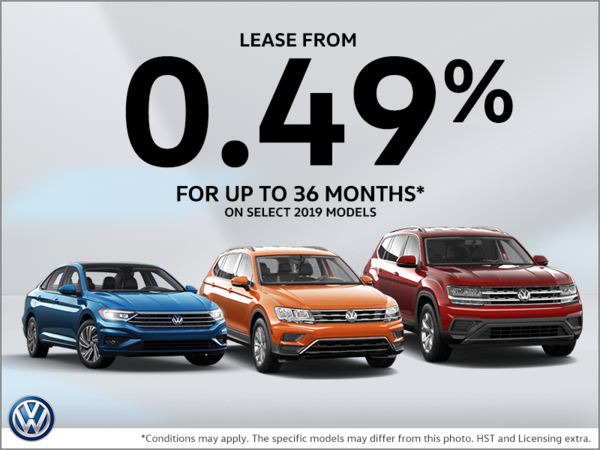 Lease a new Volkswagen starting from 0.49% for up to 36 months on select 2019 models! Limited-time lease offer available through Volkswagen Finance, on approved credit, based on a new and unregistered 2019 Jetta 1.4T Comfortline model with 6-speed manual transmission with MSRP of $20,995. $1,685 freight and PDI and $100 air-conditioning levy included in weekly payment. 36-month term at 0.49% APR. $800 down payment, $340 security deposit and first weekly payment due at lease inception. Total lease obligation: $11,577 48,000-kilometre allowance; charge of $0.15/km for excess kilometres. PPSA fee, license, insurance, registration, any dealer or other charges, options and applicable taxes are extra. Dealer may sell or lease for less. Dealer order/trade may be necessary. Offers end February 28, 2019 and are subject to change or cancellation without notice. Models shown: 2019 Atlas 3.6L Execline R-Line automatic transmission, $56,335; 2019 Jetta 1.4T Execline automatic transmission, $30,880; 2019 Tiguan 2.0T Highline R-Line automatic transmission, $43,520. Vehicles shown for illustration purposes only . Visit vwoffers.ca or your Volkswagen dealer for details. “Volkswagen”, the Volkswagen logo, “Jetta”, “TSI”, “Execline” and “Comfortline” are registered trademarks of Volkswagen AG. © 2019 Volkswagen Canada.